7 kinds of choices are listed below, please vote for the layout you want. Thank you very much! (4) No need to cut Space, no need upgrading software, the original layout is very good. If you choose to cut the space , whether we need to retain the compatibility of the original 6.25 Space? 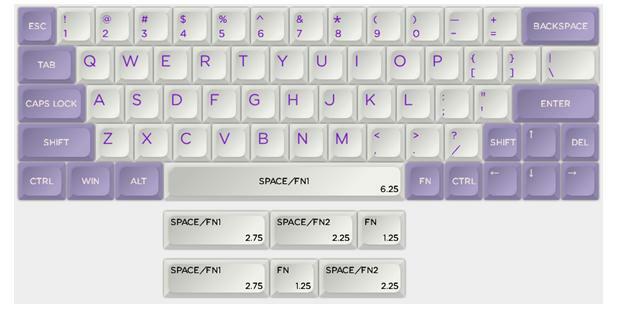 That is, the user can choose the 6.25 space, and also can choose 3FN short Space (5) Yes, (6) No. (7) If you don’t agree to any of the above, please give your suggestion. Hope we can do better iGK6X mechanical keyboards together! Thanks all of you! Custom RGB mechanical keyboards Christmas trees, to all of you! Wish all of you have a brilliant 2019! These mechanical keyboards (and RGB LED lighting effects) Made by MonkeyKing Custom.